Trump and his Republican cronies marketed the tax scam as a bill for “middle- and working-class Americans.” Their argument? Giving corporations massive tax breaks would incentivize them to invest in our economy (instead of overseas). 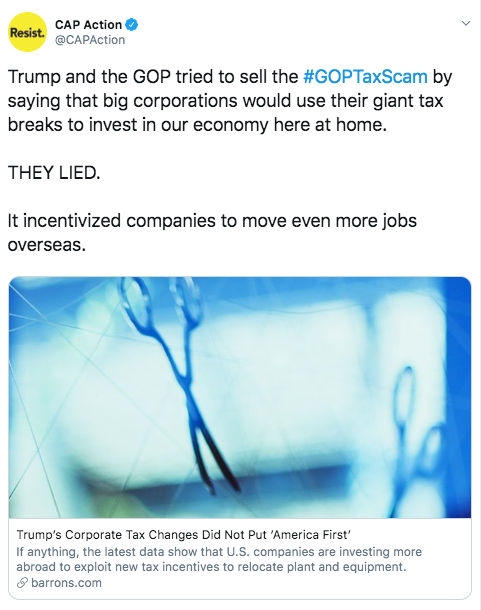 The exact opposite happened: American companies have increased foreign investment and outsourced even more jobs—and, as was widely predicted before the tax bill was passed, it actually rewards companies for doing so. Trump’s lies have real consequences. Share this tweet to spread the word. Share this tweet and let Trump and Republicans know that we need an economy that works for everyone—not just the wealthy and corporations. Despite his best efforts, Trump failed to obstruct the Mueller investigation. Now, his hand-picked attorney general is giving him another chance by sending Mueller’s report to the White House before any of it is made public. While Trump is attacking our health care through the courts, federal judges delivered two devastating blows this week to Trump’s attempted sabotage of the Affordable Care Act. There’s a growing surveillance state targeting people with disabilities. CAP’s Disability Justice Initiative team joins the Off-Kilter crew to discuss. Listen to the episode here.